The feast is also called “Petelarovden” or “Ihtima”. It is mainly celebrated in the eastern part of Bulgaria for the good health of the small boys. The traditional customs followed that day have a strong connection to the legend of King Herod who killed the male infants in search of the newborn king (Jesus), but a mother painted the doors of all the neighborhood with the blood from the cut head of a rooster, thus forging the sign and saving the life of her own son. 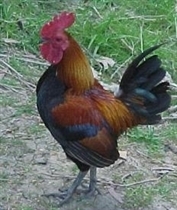 The rooster in Christian and pre-Christian cultures is the image of the herald of sunrise. It is related to the notion of resurrection of the dead, a symbol of the ever-resurrecting life. On Petlyovden, a rooster is supposed to be votively slaughtered, usually at the threshold of the front gate, and its blood is sprinkled all over the gate for life and health. A sign of a cross is placed onto young boys’ foreheads with that blood. The rooster’s head is left at the gate; the legs are thrown onto the roof of the house, while the feathers are further kept as a special medicine or for ritual adornment. A ritual meal of boiled rooster is prepared. Portions of it alongside with ring-shaped bread buns, broken in smaller pieces, are given away around the neighbourhood for health. In the Plovdiv region, that feast day is known under the name of Cherna or Tsrun Day (meaning “Black day”). There is a large number of restrictions to be followed – women are not supposed to work that day, neither to bathe or getting married – otherwise they might “tsurneyat” (meaning “to mourn a close person who died”).